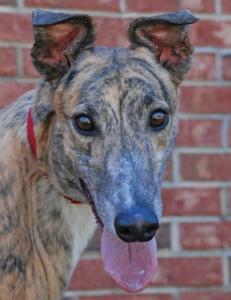 DJ is a very handsome brindle male that raced at 74lbs. He just retired from Orange Park Race Track in Florida after 107 races. He was good and got up to A level but then had a couple of falls that slowed him down so he was retired. He did well on the haul and was very friendly with everyone but did get stressed out at the vet's office. He was described as a higher energy guy at the track. DJ is 3 years old and won't turn 4 until Nov 29th. His sire is Kiowa Bet Dutch and his dam is Sol Gabriela. He didn't pass his cat test so needs a home without them and still needs to be tested with small dogs. More as we get to know him.